Lovely duplex house in Tenerife south. The villa is south facing and just 3 meters from the quiet cascading pool. 3 large sun terraces. Within minutes of harbour, beach, bars and restaurants. Pool just 2 strides away! An original and large two bedroom duplex house set in a Spanish-style pueblo, a low-level complex and many apartments with gardens and beautiful plants including palms, bougainvillea's and tropical plants. There are 5 pools, one heated including children's pool and cascades and waterfalls flowing throughout the complex.Ideal for families, with the bedrooms being upstairs and the secure gated patio being so close to the pool. Just 3 short paces away from the cascading pool and facing due south. The accommodation comprises a large twin bedroom with two single beds and a master bedroom with large double bed and a south facing private sun drenched patio, with wall to wall patio doors and a ceiling fan. Upstairs the bathroom has a bath shower and bidet. Separate kitchen with breakfast bar, large fridge/freezer, toaster, microwave, 4 ring hob and built in oven. Ample range of cups, glasses, crockery, and cutlery. The living- dining room has a double bed settee and two chairs, large dining table with 6 chairs, coffee table, TV, DVD, CD player, table and chairs and a large ceiling fan There is a convenient downstairs wash room. Patio doors lead onto 3 huge patios which enjoy sun all day. The bed configuration is as follows. There are 2 bedrooms upstairs; 1 double in the master bedroom and 2 singles in the other bedroom. There is also a single bed which pulls out from under one of the single beds. This is only suitable for a small adult or child. So 3 can potentially sleep in that bedroom. Or if you prefer, we can place that single bed in the large lounge. Or we can provide linen for the sofa bed which is a double. The choice is yours. We have a travel cot available by prior request. You should bring your own cot linen. The apartment has a washing machine. For a 2 week stay we leave a spare set of linen so that you can change yourselves but ask that you leave a set clean on departure. We offer a linen service for those who don’t wish to use the washing machine for a small extra charge. 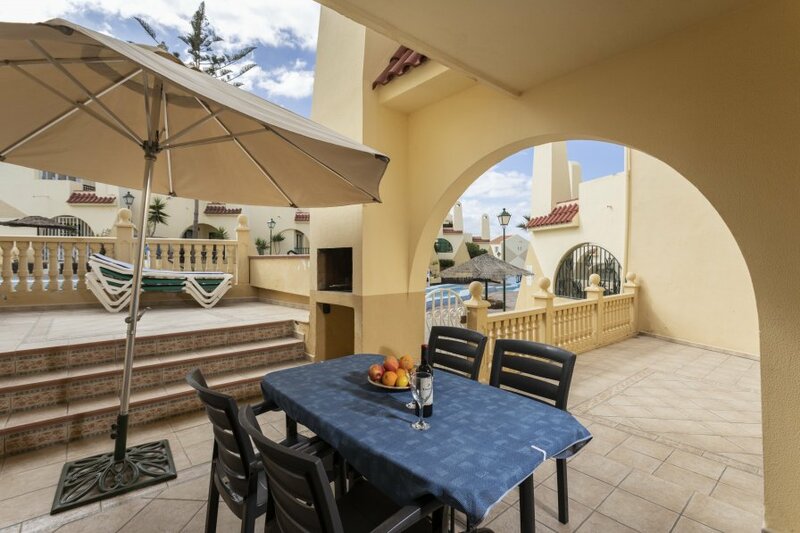 Extremely popular and convenient location - the apartments are situated in south Tenerifé in the exclusive area of Torviscas Bajo, just a short walk from center of Playa de Las Americas, and a 5 min stroll to the beach. Tenerifé South Airport is only 20 minutes away by taxi or bus around 35 minutes. There are many local attractions within a minute or two, restaurants and night-life. 5 minutes taxi from Tenerifé 's new Siam Park. Just a 5 minute walk to Fanabé Beach or the local harbour and 2 minutes from the new Commercial Centre Gran Sur, with large supermarket, Shops, restaurants and Cinemas. Also MacDonalds and Burger King! NB! WE ALSO HAVE A LARGE ONE BEDROOM APARTMENT WHICH SLEEPS UP TO 4, VERY CLOSE TO THIS ONE. SEE PROPERTY NUMBER 44340.